Patiala chicken is a variant chicken recipe in which chicken cubes are stuffed in omlet and are covered with the gravy. It is a simple recipe with a different taste. Marinate chicken cubes with little ginger-garlic paste,1 tbs kashmiri chilly powder, 1/2 tsp coriander powder, little turmeric powder, 1/4 tsp of garam masala powder and a pinch of kasoori methi. Keep it aside for 10-15 minutes. Cook the marinated chicken in 1 tbs of butter till it cooks well. Beat 4 eggs with little salt and little coriander leaves. Prepare 2 omlet or a larger one by pouring on a hot pan with little oil or butter. Saute chopped onion in the same pan we cooked chicken. Add little butter if required. Saute till it reaches brown. Keep it aside and cool. Now saute 1 tomato in same pan till it mashes well. Cook another tomato with little water, peel off and prepare puree. Grind sauted onion and tomato together to get a fine paste. Now heat a pan, add remaining butter and saute ginger-garlic paste. Add onion-tomato paste and cook for sometime. Then add chilly powder, coriander powder,garam masala powder,kasoori methi and little salt. Mix well and cook for sometime. Now add tomato puree, mix and cook for 2-3 minutes. Add fresh cream and corriander leaves, mix well and cook for another 2-3 minutes. Place omlet in the middle of serving dish, place the cooked chicken over it. Pour little gravy over the chicken pieces and cover with the omlet. Now pour remaining gravy throughout the stuffed omlet. decorate it with chopped coriander leaves and fresh cream.. 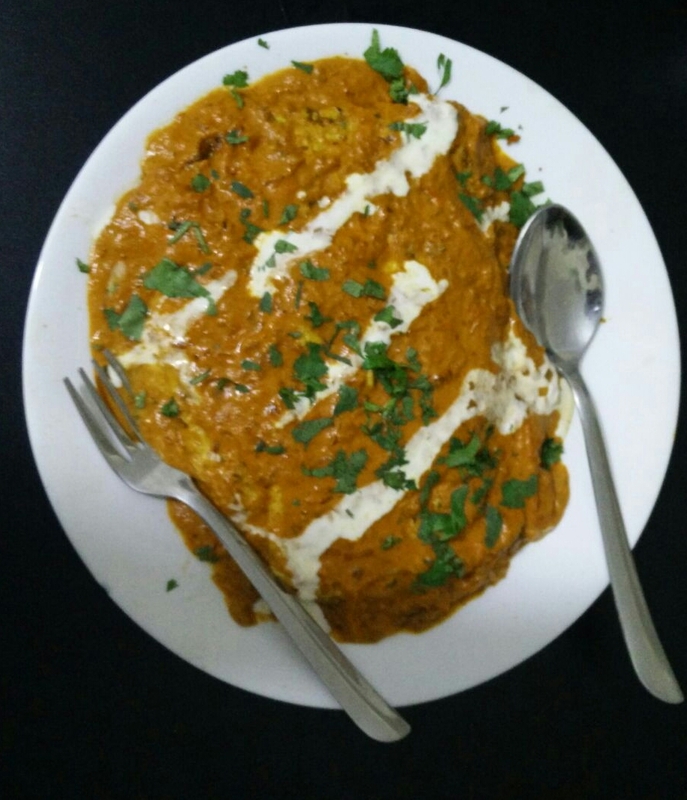 Delicious patiala chicken with omlet is ready. Lets have a try on it.